Will Telecom Plus turn, or will it continue to rise beyond 1389p? The chart shows the price action for Telecom Plus over the last 5 yrs. 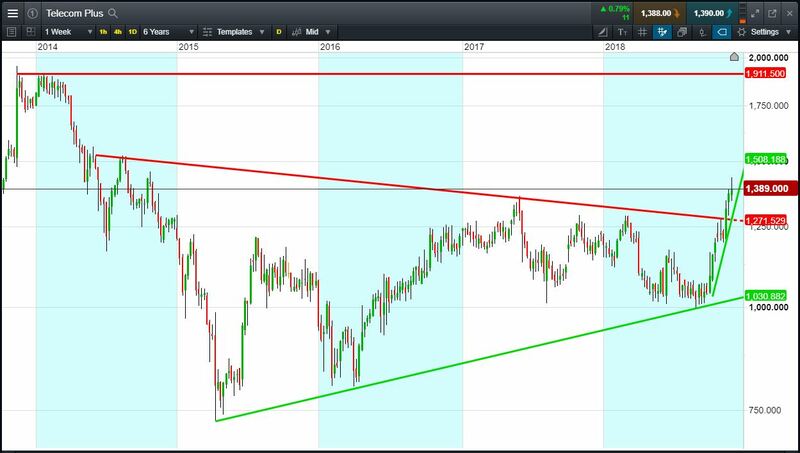 The shares have broken above a resistance trendline at 1270p to trade 4yr highs. The shares are currently 1389p (at time of writing). The ‘trend is your friend’. Will it continue? Shares -1.3% from 2018 highs; +38.1% from 2018 lows; +15.7% year-to-date. Let’s say the breakout appeals to you, you think it’s likely to continue to 1911p. You decide to buy exposure to £10,000 worth of Telecom Plus using a CFD, at the current price 1389p (at time of writing). To do this, you need £2,000. Let’s assume the Telecom Plus trend continues upwards to 1911p (+37.6%). Your profit would be £3760, from your initial investment of £2,000. Conversely, let’s assume you open the above position, and place a stop-loss at 5% from the current price. Telecom Plus breaks lower, falling 5% and it hits your stop-loss. Your loss would be £500.